This is part of our DEIS plan to encourage school attendance. 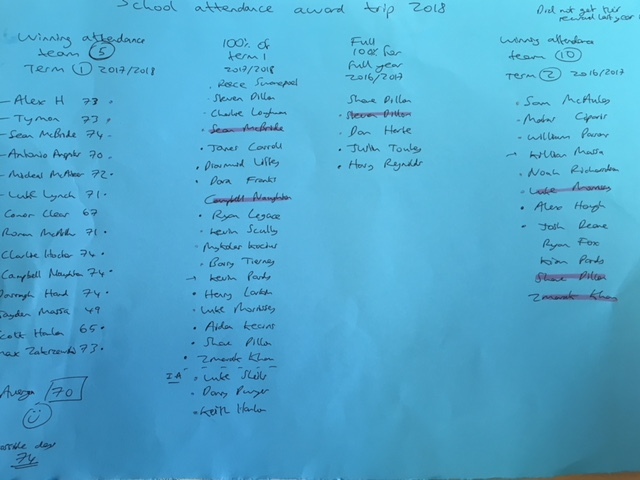 The boys from our attendance team E who won term 1 with an average of 70 days from total of 74 days , boys with 100% / improver certs for term 1 / 100% attendance boys for school year 2016-2017.Also a winning team from last year who missed their reward. All names will be on website later. Total of 47 boys qualify. All of these boys have made a great effort to attend school and we are delighted to offer them this trip this term. Previous team prizes are been Birr OEC / Birr pool / Tearaways and Birr restaurant. To travel and take part in the Dublin Trip on Monday. I would like to inform you of the implementation of the 2017 Children first National guidelines/ 2017 DES Child Protection Guidelines. All schools have some new measures to put in place and are directed to close for two half days this school year. Schools are not currently permitted to combine half days. Our school (along with Mercy Primary) will close for half day (12.30pm next Wednesday 14th February) to facilitate staff training. The other half day will be planned for term 3. We ask families to make arrangements for collection and childcare on that day.